Soooo cute, and sooo hungry! If it gets hot enough, that sprinkler will cool them off I hope. They are adorable! I am always amazed at where birds will build a nest. Kathy-- I have to stop there once a year to watch the swallows and their young. Barbara-- Only if there's a fire! Leslie-- These swallows (at least a dozen of them) build their nests on a ledge right above a very busy walkway at the Ace Hardware in Benson, Arizona. 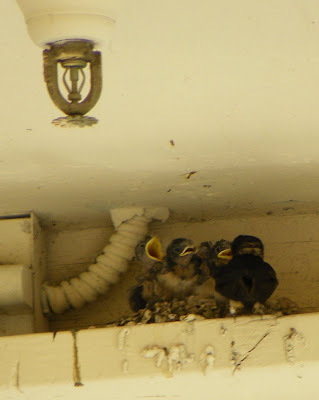 When we go to Bisbee in June, I always have to stop and watch them.